This report is a result of the research partnership between the Santam Group, WWF, University of Cape Town and Council of Scientific & Industrial Research, and was produced in collaboration with UNEP FI. 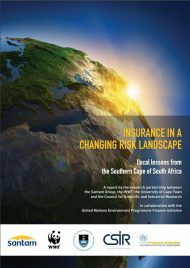 It features a case study on the current and future risk exposure to wildfire, flood and sea storm in the Eden District Municipality of South Africa, and offers insights on risk drivers such as climatic changes and human-induced changes to land cover and the buffering capacity of ecosystems. This makes a case for ‘ecosystem-based adaptation’, an approach that uses biodiversity and ecosystem services as part of an overall adaptation strategy, complementing traditional actions such as infrastructure development. The report suggests a systems view of risk assessment, and a more proactive approach to risk management through a shared response at the local level. It was launched during the 2011 UN Climate Change Conference in Durban, South Africa at an event focusing on how governments and the insurance industry can work together in building climate-resilient communities.